Where is the Contentnea Creek Estates? 3 Waterfront home sites on Contentnea Creek in Pitt County near Ayden and right outside of Greenville, NC. For more than a hundred years, Greenville was known only as being an important tobacco market and the home of a small state college. However, by the mid 1960's, things began to change. The East Carolina Teachers College, Greenville's small state school, had grown substantially becoming the third largest state-sponsored school. Soon enrollment approached 8,000 students, that's twice the number recorded in 1960. In 1967, it became East Carolina University and within a decade, the ECU Medical School admitted its first four-year class. In 2000, enrollment at ECU topped the 18,000 mark, and now exceeds 24,000 students. ECU remains a benchmark in education and culture for the region to this day. Greenville's modern economic expansion began in 1968 when Burroughs Wellcome, a major pharmaceutical research and manufacturing firm, chose Greenville as new home acting as a catalyst for vast industrial growth. 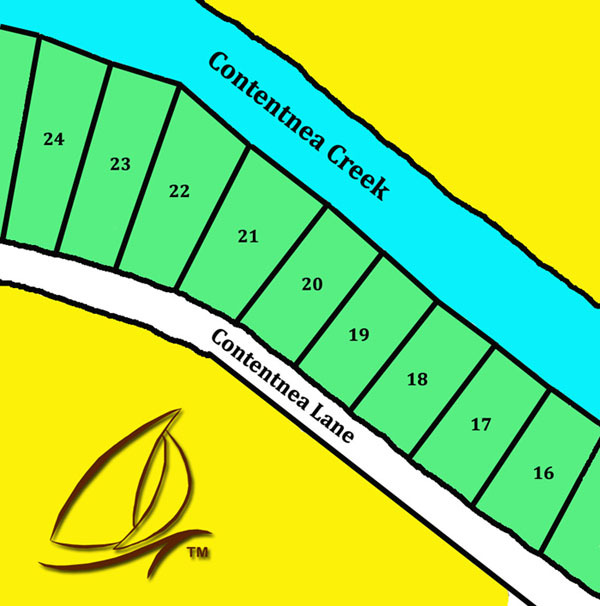 Contentnea Creek large waterfront lot prices start from $49,990. For information, maps, directions, prices and more contact us today.